A basement site is never the ideal one for a restaurant – never mind a hotel restaurant, a type that has historically struggled to convince non-residents that it is a viable or desirable eating option, even without a subterranean setting. But that all changed for London hotel, Number One Aldwych, when Casson Mann redesigned its existing basement restaurant to become a destination dining experience, hosted by multiple Michelin-awarded chef Eneko Atxa (like all true superstars, he is now known by just one name, Eneko), lured over from his Basque stronghold in Bilbao. 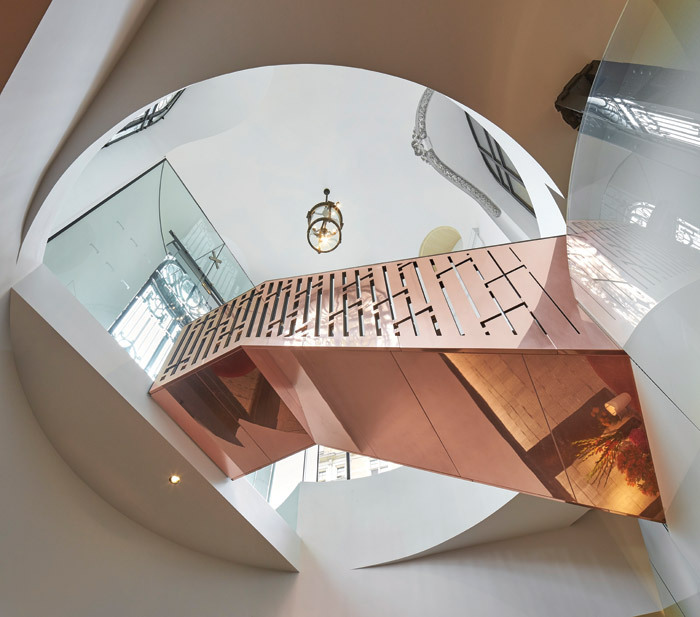 Casson Mann had never designed a restaurant before, and the client knew that when they asked the practice to revive the fortunes of this spot, which had been underperforming since the hotel opened 17 years before. Says founder and director Roger Mann: ‘There was a nervousness but an appetite for not having restaurant designers.’ What Mann and his team did was the same thing that they do for exhibitions – through painstaking research, arrive at an essential narrative that can be told through materials, form and lighting, expressing the ‘core characteristics’ of Eneko’s northern Spanish cuisine. But while a basement setting can be mysterious and desirable at night, it struggles in the day without natural light. So arguably Casson Mann’s most important move was to get rid of a mezzanine floor, and insert a floating staircase between the entrance and basement, either side of which daylight pours in. At lunchtime, the effect for diners is quite magical – surrounded by colour, craftsmanship and pooled light, it evokes the structure and solidity of a cave but with a classic kind of glamour more redolent of Fifties’ New York nightclubs. The penetrating and mysterious qualities of top lighting is a wonderful device that has served cathedral and temple designers for many centuries. And it’s this that light artist James Turrell exploits so powerfully in his many subterranean works. So it’s small wonder that, in designing a massive basement extension for Aarhus Art Museum in Denmark, Turrell has been asked to collaborate with Schmidt Hammer Lassen. The project, which entails excavating 1,400 sq m underneath the current site, incorporates two of Turrell’s artworks into that structure. One of them, The Dome, will be a 40m-across and 17m-high open-air gallery set within the new extension, intended for performance artists. Called The Next Level, the €40m extension will open in 2021. MICA Architects has developed something of a speciality for excavating beneath listed or protected structures to create valuable additional space, working on historic buildings including the Grade II listed Honourable Society of Lincoln’s Inn HQ in London as well as various Oxford University buildings, including a spectacular new space beneath the Queen’s Library. There are some who actively choose to go underground for the qualities it offers – insulation, privacy and the attractions of an unusual setting. That was part of the appeal for Moxon Architects. A great lover of the outdoors, director Ben Addy was surprised when he set up a Scottish office, near the Cairngorms he loves, to find that it quickly became almost as busy as his London one, with a mix of residential work, offices (for Aberdeen Council, as well as the HQ of the Cairngorm National Park), hotels, engineering and road infrastructure projects. Temporarily located in a converted barn, from where Addy also runs a construction company, now Addy is preparing to move his crew into their own, purpose-built HQ a short drive away, set into a disused quarry but surrounded by woodland. The contours of the quarry become part of the building, with the setting maximising privacy and acoustic insulation. It’s a most unusual site for an office; Addy thinks being bedded into the landscape, in the middle of nowhere, brings its own poetic qualities. He says: ‘There is a romantic, humanist aspect to it: to be working on interesting and diverse projects but in an unusual and beautiful setting. It’s a kind of privilege – but without privilege itself. There’s a Scots word “thrawn” – a kind of stubbornness, that comes to mind. A sense of: “To hell with it. I’m going to do it anyway.”’ But whether working on HS2 projects or high-end art hotels, he says he almost keeps the Scottish base a secret. ‘I’m actually working from the centre of the Cairngorms National Park. We have demonstrated to ourselves that it’s perfectly possible and there’s no reduction in terms of scope of projects we are working on.’ Expect the price of disused quarries to rocket. 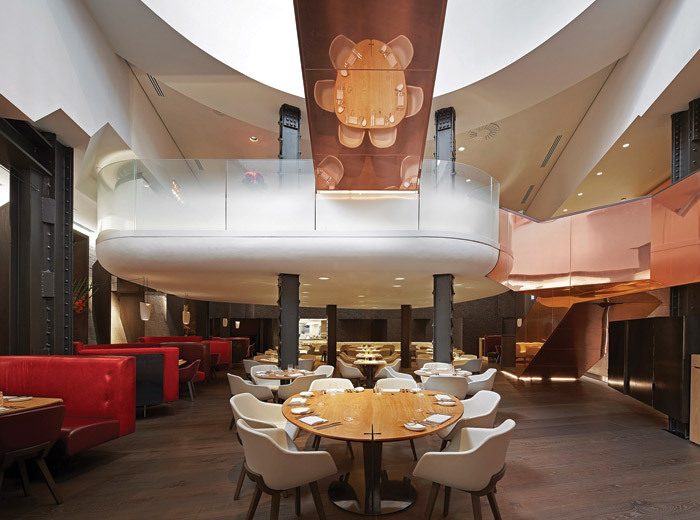 In transforming a basement restaurant at hotel Number One Aldwych, for Spanish superstar chef Eneko Atxa (known just as Eneko), Casson Mann was inspired by a food writer’s comment that Eneko’s food expressed the ‘core characteristics of its ingredients’. So Casson Mann sought to develop a palette of materials that were also about expressing Eneko’s home town of Bilbao and its surrounding Basque region, but in a way that dialogues well with London. The first and most important move was to bring a sense of arrival and as much daylight as possible into its basement location. This Casson Mann did by knocking out a mezzanine floor between the ground floor and the basement, and adding a new Strandfacing entrance, whose door opens on to an elegant staircase that appears to float down to a small mezzanine bar, before curving round and down to the restaurant below. Two large light wells either side of the staircase (by Apple store engineer Eckersley O’Callaghan) bathe the rich tones of the restaurant interior in daylight. Taking the two things that the Basque country is famous for – shipping and quarries – and adding the indigenous forests that surround Bilbao, the interiors palette is primarily wood, stone and steel. To reflect the quality of the food, Casson Mann director Roger Mann wanted ‘authenticity’ in all the materials. The floor is a German oak speckled with grains and knots. The back wall is pine, chiselled into scallop shapes and painted black. Tables are slabs of chestnut, all supplied by a local furniture maker in Bilbao. 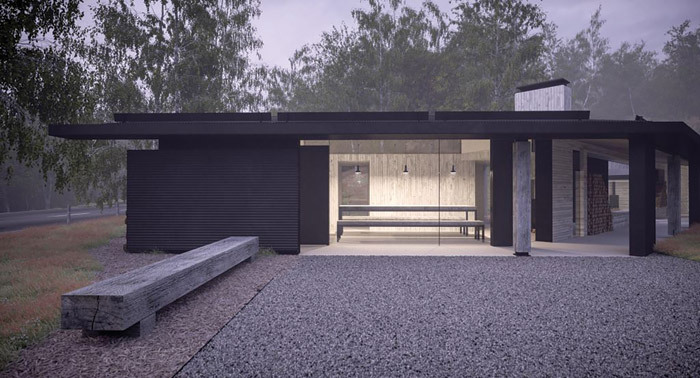 Ben Addy defied expectations when he set up the Scottish outpost of his practice, Moxon, in the Cairngorms only to find this remote office becoming as busy as his London one. So when they outgrew the converted barn the practice was camped in, it is true to unconventional form that Addy decided to locate his new, expanded Scottish office in a disused quarry. Moxon’s new HQ is described as a ‘studio of two halves’. Two low-lying buildings sit at either side of this disused quarry landscape, in Crathie, Aberdeenshire, enjoying views on to the Site of Special Scientific Interest (SSSI) around them, liberally dotted with mature birch, aspen and rowan and natural grasses. One is a single-storey, welcoming, social block for presentations and more collaborative work, looking on to the nearby road. A covered walkway links this to a more private building, for study and creative contemplation, tucked down into the quarry’s contours. Comprising a studio, meeting rooms, offices and back-of-house facilities, its quarry setting gives it protection from road noise and creates a peaceful, concentrated work area. The solid back wall brings thermal as well as acoustic benefits, while the front enjoys views on to the surrounding forest and SSSI scenery. With a combination of metal and planted over-sailing roofs, the project’s materials and contours reference the local Cairngorm architecture. Designed for rapid construction, the buildings feature steel portal frames and walls will be constructed from untreated sections of Douglas Fir that will drop into the steel frame. Fireplaces and floors will be concrete. 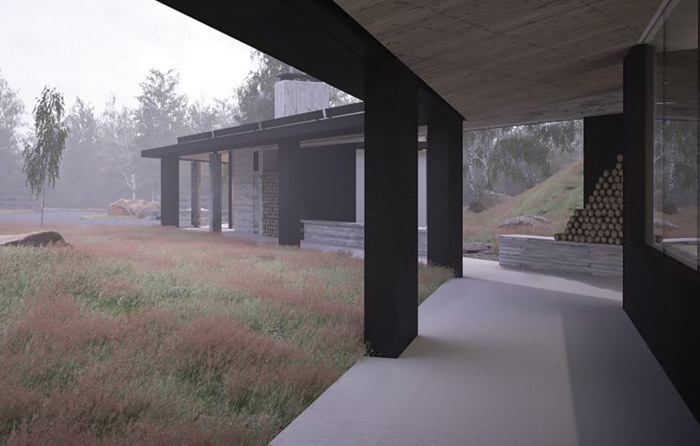 The external timber will be charred while the interior will be completely green. Says Addy: ‘The building will dry out and age with us. We get a nice thermal massing which you can’t normally achieve in timber.’ The wooden walls will also be robust enough to take whatever the team throws at them in terms of displays and mock-ups. 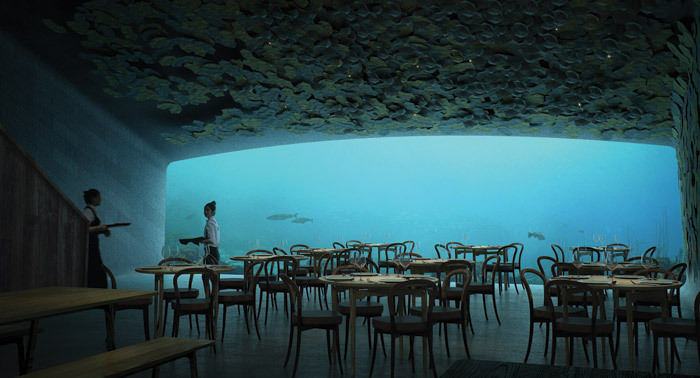 Occupying a unique underground as well as underwater site, Snøhetta’s proposed restaurant, called simply Under, at the southernmost point of the Norwegian coastline, is all about immersing visitors in nature. Like a poetic inversion of the usual domestic order, instead of gazing on fish and sea creatures in a bowl, customers will be contained within this acrylic and concrete bowl, gazing out at the aquatic flora and fauna. More than just a restaurant, however, it will be a research facility for marine biology studies outside of restaurant hours. 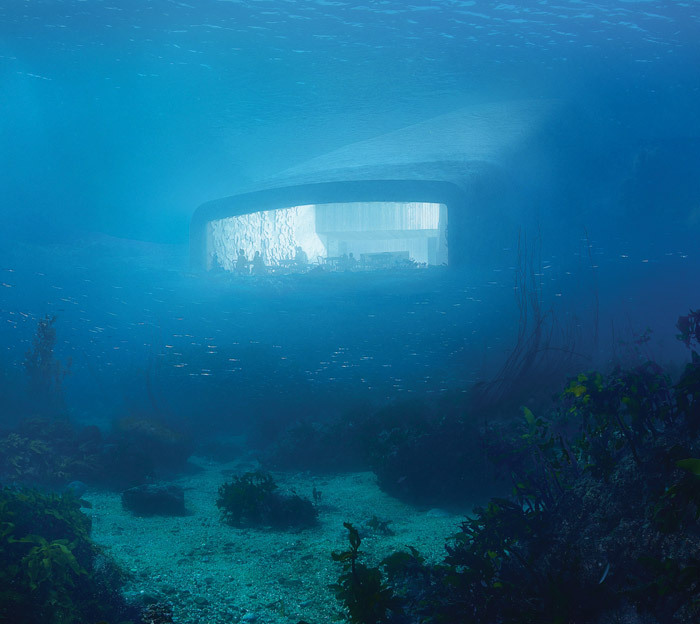 With metre-thick concrete walls, the structure is built to withstand all underwater pressures, with an 11mx4m acrylic window giving panoramic views into the ocean, as well as a constant view of the seabed in all seasons and weather conditions. Blending into its environment, the sleek, streamlined exterior form of the building is inspired by shell structures, its coarse concrete finish is designed to encourage mussels to establish a new habitat across its roof. This in turn will help to attract more marine life into the area. Lighting will be subtle from the inside of the restaurant, to ensure that it does not disturb or repel sea life. The restaurant is designed to accommodate 80-100 guests, who will descend from the tidepool entrance, through a wardrobe area, to a champagne bar, looking down into the restaurant itself. On the restaurant level, Danish chef Nicolai Ellitsgaard Pedersen is scheduled to provide a high-end, locally sourced seafood menu, within an interior environment that either contrasts with or enhances the rocky surroundings. The restaurant will feature warm, oak furniture, against a palette of dark blues and greens. The bar will offer a lighter, shimmering palette of colours inspired by the sediment of shells, rocks and sand. Advanced heat pump technology will utilise the stable seabed temperature to heat and cool the building year-round. The lurking concrete presence of the Tirpitz Bunker was a squat, dark reminder in the dunes of north-west Denmark of the brief Nazi annexation of this coastline as part of its Atlantic Wall defences, during the final phases of the Second World War. Now it has been transformed into a ‘sanctuary in the sand’, as architecture practice Bjarke Ingels Group (BIG) calls it, with the excavation of the area behind the bunker and construction of a new 2,800 sq m visitor and exhibition centre. 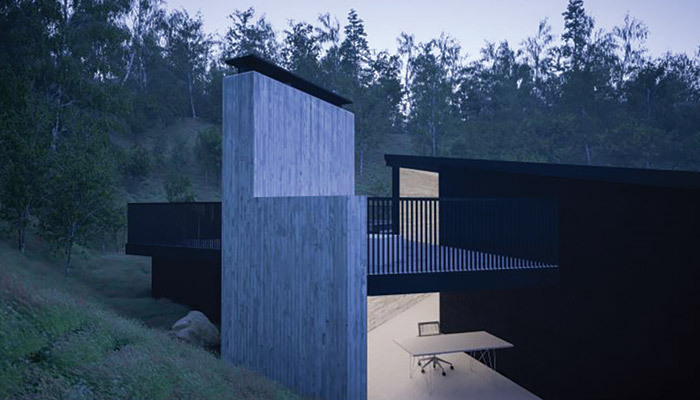 Completely invisible from the road, the new structures are approached via a simple, heath-fringed path that goes past the bunker and up a gentle slope, arriving at a courtyard intersection of paths that criss-cross this jagged structure. Walls have been cut into the dunes from all sides and descend to meet in this central clearing. The courtyard allows access into the four underground gallery spaces, and views through the substantial windows that allow substantial amounts of daylight into the building. A lobby, ticket desk, shop and cafe are all placed at ground level, with sightlines into the exhibition spaces below. There are four exhibition galleries, one for temporary exhibitions and three permanent ones designed by Dutch agency Tinker Imagineers. 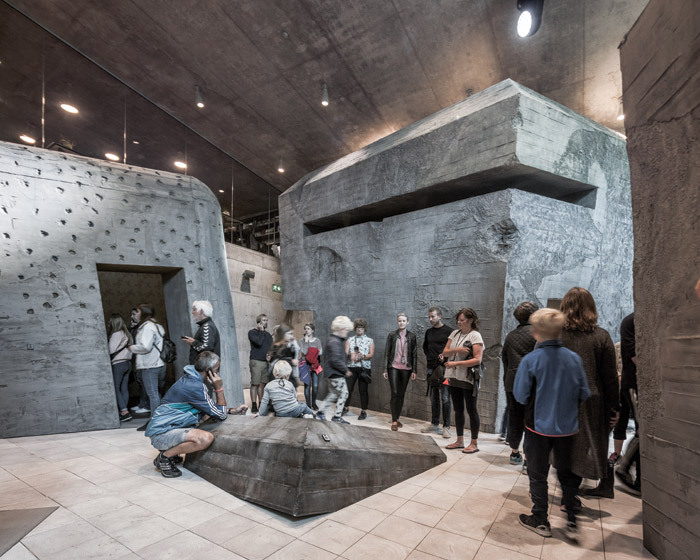 A sculptural array of seven concrete mini-bunkers relate the stories – both visually and aurally – of seven people who experienced life under occupation, from Anna, a 20-year-old Dane who falls in love with a German solider, to Gerhard, a young soldier writing letters to his mother. Another room offers a local history of this coastline, with projections washing across large, MDF display structures conceived as rocks or dunes. A fourth gallery offers a history of amber, called Gold of the Sea, recounting the treasures found in this area and displaying the country’s largest collection of amber. A central corridor between the galleries turns into a tunnel that provides access to the bunker itself. 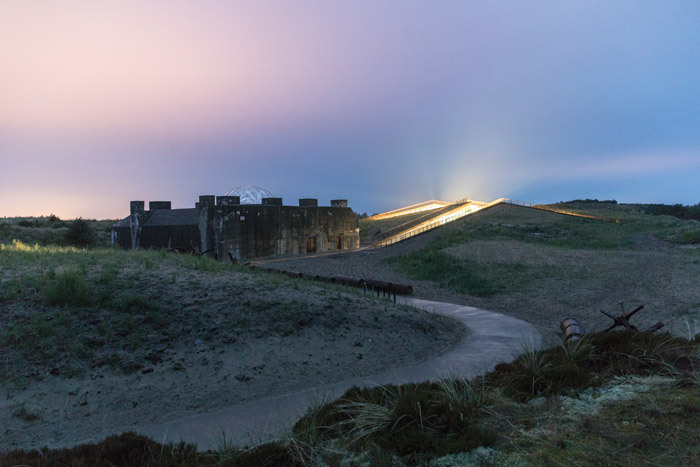 Never completed, this bunker with its massive, metre-thick concrete walls has a monumental presence made all the more vivid by the simple paths carved through it, dramatic lighting and the stories of its construction and partial occupation, told via audio-guides. 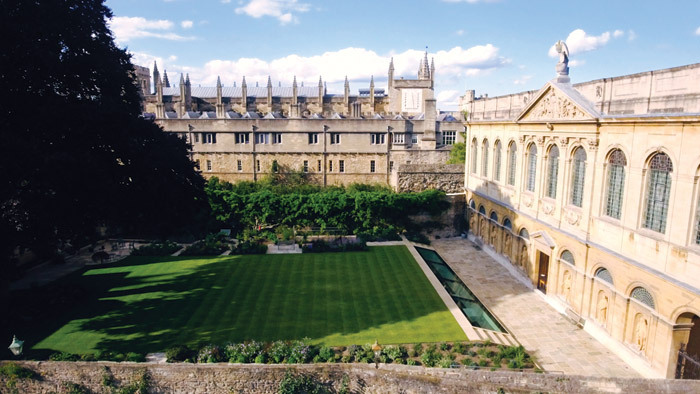 When MICA architects was commissioned to double the existing library space at The Queen’s College, Oxford, it was challenged to do so under a garden adjacent to the original, listed library (1692-95). It had to do so while making sure that no damage was done to the original structure or its ornamental panelling, nor to a 150-year-old copper beech or a 200-year-old wisteria that would sit very close to its new structure. 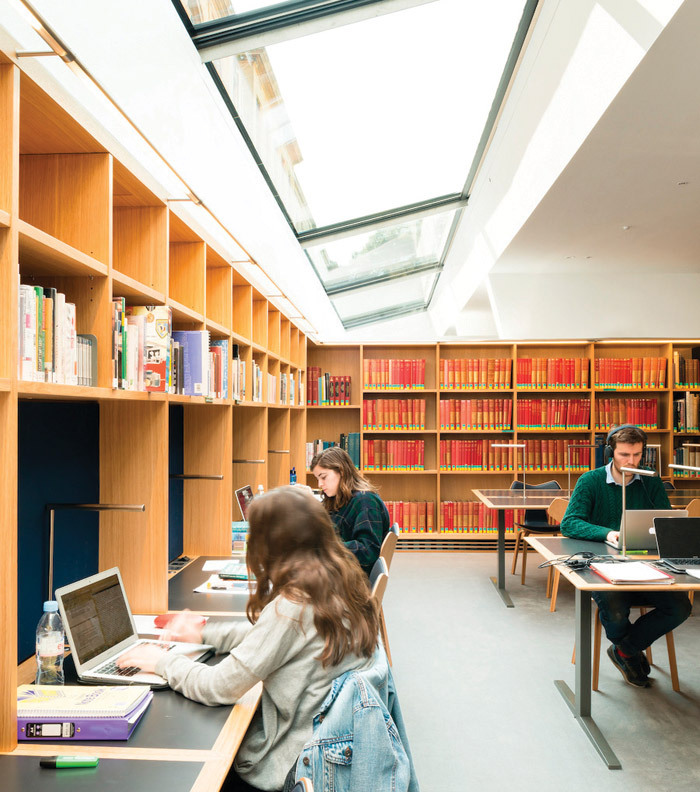 The new library provides an extra 800 sq m of space, doubling the available library space, and adds to its facilities with a new, light-filled reading room, an archive for the college’s Antiquarian collection, a new Peet Library of Egyptology and a multipurpose room for collaborative learning. This additional space also means that the old building can revert to its earlier arrangement and grandeur. The perimeter of the new basement was established 600mm away from the existing building. It is set beneath a new garden with its edges sloping subtly into the landscaping, allowing a row of roof lights along its perimeter to pour daylight into the space below, while also providing views back on to the 17th-century facade. Employing 21st-century technologies along with traditional craftsmanship, features include large-format frameless glass, and tailor-made oak cabinetry. Thermal energy is transferred from well below the building via 50m deep piles to the new air handling and heating/cooling coils in the plant room. This arrangement should provide great thermal stability throughout the seasonal variations to both levels of the library. Architects – the project was restarted in 2014.